At the heart of apartheid lay the fortification of South African cities as white spaces. Above all, this meant the prevention of non-whites from entering city centers by force if necessary and cloaking this in the rhetoric of legality. A series of key developments in the 1970s and 80s, however, catalyzed a reversal. Most prominently was the repeal of the pass laws in 1986, the set of laws that required non-whites to carry pass books with them at all times and limited their entry into spaces designated as “white group areas.” In the case of Cape Town, designated a so-called “Colored Labor Preference Area” during this period, Xhosa residents were deemed “migrants” and deported over a thousand kilometers eastward to state-created “homelands” in the Eastern Cape. The systematic underdevelopment of these rural bantustans left many so-called “African” South Africans with little choice but to return to cities in search of employment. As the apartheid state began to shy away from the 1960s and 70s model of forced relocations, by the early 1980s, black residents were able to establish squatter settlements in peri-urban locations around the country, seeking jobs in cities and having no other affordable housing options. This is not to suggest that informal settlements were not already present in urban areas—they date back to the 1890s, and above all, to the period of interwar industrialization—but they multiplied at an unprecedented rate during this latter period. The sudden lifting of influx controls meant a rapid but delayed urbanization. These residents had been forcibly kept out of many cities since at least the 1930s, and certainly since the passage of the Group Areas Act in 1950. With the transition to democracy in 1994 and the African National Congress’ ascension to power, this immediate proliferation of shantytowns was viewed by the ANC as a threat to its own legitimacy. Mandela’s promise of a million houses within a decade was expeditiously fulfilled, with the development of a massive housing rollout plan in 1994 as part of the Reconstruction and Development Program (RDP). People in need would receive formal 40 m2 houses, called “RDP houses,” free of charge. Even after the closure of the RDP office two years later, these houses would continue to be called “RDP houses,” at least colloquially, and retain this name even today. Every person in every shack settlement in South Africa who I have encountered knows what “RDP house” means, and this is generally the term used to describe state-provisioned formal housing. Since 1994, more than 3 million such RDP structures have been delivered. As Tokyo Sexwale, then Minister of Housing, famously remarked in 2010, “The scale of government housing delivery is second only to China”. Assuming the average household size of 3.6 people, this means that nearly a quarter of the South African population has been housed under this delivery program. Yet during the same two decades since 1994, the number of informal settlements has increased more than nine-fold. Currently, between a quarter and a third of urban South Africans live in informal housing. This might take the form of informal settlements, or sometimes, as in most of Cape Town’s so-called Colored townships, it means that people erect shacks in the backyards of formal houses and pay rent to the homeowner. Thus the same period during which all of these people were formally housed saw an exponential increase in the number of people living in shacks. Despite one of the most substantial housing delivery programs in modern history, urban informality mushroomed during the two decades following apartheid. The overwhelming bulk of this can be attributed to late and post-apartheid urban influx, driven above all by the underdevelopment of the bantustans. Frequently too, RDP house recipients illegally sell their homes for a fraction of their value in order to meet immediate needs. If accepting an RDP house frequently requires relocation to a peripherally located site, commuting costs can increase substantially. Given that no transport subsidy is provided and these houses do not come with jobs, they are often sold out of necessity, with residents returning to the same informal settlements and backyards where they were before. More damningly of the more than 3 million RDP homes constructed between 1994 and 2010, more than 2.6 million of these are at “high risk.” Nearly 610,000 of them need to be demolished and rebuilt altogether, and this is according to the National Home Builder Registration Council’s (NHBRC) own figures. Twice that number have workmanship related issues, which the NHBRC estimates will cost on average R12,000 ($1130) per house. The combined cost of remedying structural defects, minor defects, and non-compliant construction is estimated to be R58.7 billion ($5.5 billion). The shoddy construction is largely attributable to so-called Black Economic Empowerment companies, in essence private sector startups given nepotistic contracts with no oversight or accountability in the name of some sort of progressive affirmative action. Given the extremely low profit margins in RDP housing delivery, larger construction companies tend to shy away from applying for these government construction contracts, or “tenders” as they are known in South Africa. In other words, the privatization of implementation means that costs are trimmed at the expense of providing durable structures. When the Department of Human Settlements releases a subsidy for an RDP house, the structure ultimately provided by a private contractor must meet a number of national guidelines in terms of size and quality. But with RDP home provision far from a lucrative industry, these companies have every incentive to cut corners. What began as an attempt to resolve the post-apartheid housing crisis has now actually exacerbated it. What began as an attempt to resolve the post-apartheid housing crisis has now actually exacerbated it. RDP delivery has reinforced the apartheid era geography of relegation by formalizing peripherally located shack settlements, rendering their far-flung locations permanent. With these houses already deteriorating and residents frequently opting to sell them off, delivery has hardly served as the antidote to proliferating urban informality. Whereas post-apartheid housing protests were initially most common among shack dwellers, cities across the country have witnessed a recent rise in protests by dissatisfied RDP recipients. In Cape Town, these protests have spread across the Cape Flats, from Scottsdene in the northeast to Pelican Park in the southwest. 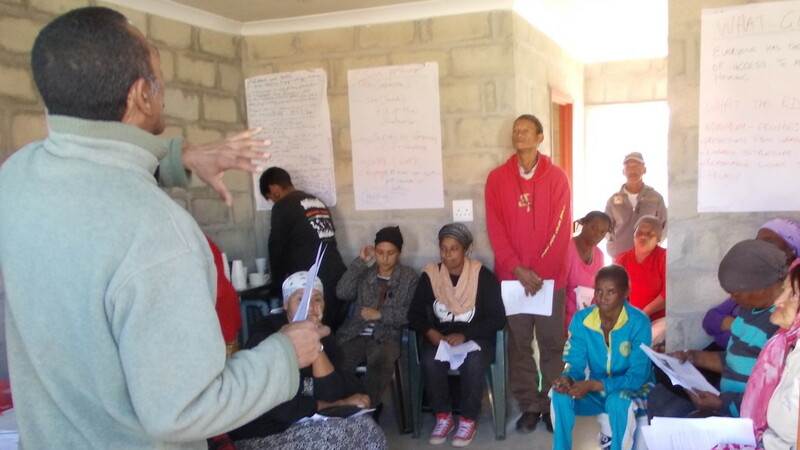 Increasingly RDP beneficiaries are joining the ranks of informal settlement dwellers and backyarders in organizing against the municipal state, the perceived culprit of the post-apartheid housing crisis. When I visited one such residential RDP development in Cape Town in early June, I encountered houses much smaller than I was used to seeing—they didn’t even seem to comply with the 40 m2 requirement. This development—Pelican Park—is a flagship project for the City, providing countless photo ops for Mayor Patricia de Lille, Western Cape Premier Helen Zille, and numerous other visitors. Ten years in the making, it is the City’s first integrated housing development, meaning that RDP houses, subsidized gap units, and mortgaged housing will exist in the same development. Roughly 2000 RDP houses will exist in Pelican Park when the project is completed in 2017. Beyond the size of each house though, it was the shoddy construction that was driving recipients of these structures to organize against the City. Residents were beginning to form various neighborhood committees to contest what they viewed as deficient housing. One recipient of a new home, Layla, took me into her new place. I met her when she was still living in an informal settlement just a few kilometers away, but after years on the waiting list, she finally secured a formal structure at the new housing development of Pelican Park just a few months ago. The internal walls were left unplastered and made of large, light gray concrete bricks. If you rubbed the bricks—and not even particularly vigorously—sandy material would fall away. One could easily rub a divot into one of these bricks in a matter of minutes. She took me upstairs. At the top of the staircase, there were two doors. Each led into a tiny roombarely large enough for a queen-size mattress—also unfinished. Layla pointed to various cracks that had already appeared in the wall. Granted yesterday was one of the coldest days I’d experienced in Cape Town—there was even a bit of snow in Mitchell’s Plain, an exceedingly rare sight—but it was freezing in there. The walls provided little in the way of insulation, and there were generous “vents” cut through the brick all throughout the house, effectively rendering inside and outside equivalent temperatures. We descended the staircase again. At the bottom was the living room, with a tiny kitchen in the hallway leading to the front door. There was a small bathroom—again, with very large cracks in the brick—and then another tiny room—the smallest of them all— right next to the front door. Once back inside, the third woman pointed to the walls. “Look,” she said, taking us into the bathroom. “It’s not cement, but just sand pushed together to look like cement. See all these lines, these cracks? In a new house! What’s it going to look like in 20 years? It’s all falling out already!” She pulled out her phone. “I must show you these pictures of my house. Give me your number and I’ll send them on WhatsApp.” She showed me one photo where she’d removed the cover on the light switches, and in the hole behind it, the wall was stuffed with crumpled newspaper. “How is this not a fire hazard? They aren’t supposed to put paper in there, but it was cheaper than real insulation or even concrete or sand. They didn’t even fill it in!” A second photo revealed a sizable crack in the ceiling that was there when she moved in. A third showed a light fixture falling out of the ceiling. “That one they told me they’d fix. Not the crack though.” Layla chimed in: “Now Human Settlements wants to come because we’re meeting. Before they were trying to run away from me, but now they see we’re getting organized.” The older woman joked, “There they busy with my roof,” pointing in the direction of her house. Two weeks later I returned to Pelican Park. Residents had constituted themselves into three committees. The purpose of each committee was to represent RDP recipients in their struggle with the City over the faulty homes. “This is one committee,” Layla told me, “but there are two more. Pelican Park is coming in three phases, and so that means three committees. Each will choose two people, and then there will be six on the umbrella body. That means that six will report back to the Housing Assembly. The rest of the working group is meeting tomorrow.” It was interesting to watch how representative bodies formed in the earliest part of this relocation site. The residents in Layla’s phase of Pelican Park were meeting to form a local committee, and I’d come to help facilitate an interactive workshop on the RDP housing crisis with a few members of the Housing Assembly. We were holding the workshop and meeting in an empty RDP house; the recipient had yet to move in. Winnie disappeared to go make sandwiches while the meeting began. Layla gave the introductory remarks. “I’m an activist,” she emphasized. “Not ANC, not DA. I come from Zille-Raine Heights where we took land because we were gatvol of backyards, gatvol of being on the waiting list, and gatvol of paying rent. They tried to move us to Happy Valley, but we refused. We know that the database don’t actually work. There’s people that’s five months on the waiting list that got a house here. But others 30 years, 23 years on…the waiting list.” She was presumably referring to others in Zille-Raine Heights who did not receive houses in Pelican Park. No one was clear as to how the selection process proceeded. A few days later, when I interviewed the City’s head of housing allocations, Alida Kotzee, she explained some of these disparities. While typically RDP houses are allocated according to time on the waiting list, “this case was political,” she told me. Then Mayor Helen Zille had personally promised the residents of Zille-Raine houses, and so they named the settlement after her. Moreover, the land these residents were occupying was owned by a nearby school, and so residents needed to be relocated. Thus while generally RDP provision proceeds according to the demand database, exceptions are made in cases of land invasions and other contingent circumstances requiring immediate attention, or else in “political” cases. Zille-Raine Heights was both political and a land invasion. No answer was provided as to why all residents weren’t relocated, but I didn’t press the matter. Beyond the problem of the selection process though, residents remained dissatisfied with their homes, viewing them as haphazardly constructed warehouses for the poor. “They promised us free-standing, but these are not even semi-detached!” one woman inside the meeting shouted. “They showed us the plans, but these houses are 3 or 4 in a row. It’s all lies, empty promises. We’re being lied to. This is not what we signed for. It’s unhealthy here—unhygienic. It’s like a dirtbin through my house.” More complaints: no sports field or park for the children (as guaranteed in the RDP, claimed Ebrahiem); a lack of amenities—schools, clinics, churches, mosques; there’s no library; safety and security is already becoming an issue, and they weren’t provided with burglar bars. These were residents who had been living in informal settlements or in backyards, many without electricity. On my last visit to Zille-Raine Heights, people were cooking over an open fire in the middle of a field, and some of the shacks I entered had dirt floors and low ceilings. These RDP recipients’ standards were not high, yet here they were, organizing a neighborhood council in order to contest the delivery of houses they alleged were substandard and in some cases, already falling apart. This crisis of delivery in post-apartheid Cape Town is hardly an aberration, but mirrors experiences in municipalities throughout South Africa. The fact that the majority of RDP houses are substandard or pose health and safety risks only two decades after the program’s inception is obviously alarming. But even more significant is the fact that rather than mitigating the demands of the post-apartheid housing crisis, RDP delivery appears to actually accentuate them. If delivery began as a means for the ruling party to both control rapid urban influx and shore up its own legitimacy, the current delivery regime has resolved neither problem. Above all, deficient delivery only intensifies anti-state politics. Far from placated recipients removed from the rolls of the waiting list, residents remain incensed, dissatisfied, and above all, organized against municipal governments. When analysts write about the recent spike in service delivery protests across South Africa, it is frequently presumed that delivery will conciliate residents and dissipate this “rebellion of the poor.” In other words, delivery and protest are typically viewed as antithetical. Yet as the case of Pelican Park demonstrates, recipients of the ultimate service—free formal housing—are far from satisfied. Rather than the endpoint of the post-apartheid urban crisis, deficient delivery reproduces it anew, accentuating discontent in the process. Residents’ names are scratched from the waiting list and from the municipal state’s perspective, these cases are considered closed. But for relocated residents, this is simply the continuation of their struggle for access to decent housing. Removal from the waiting list without the receipt of houses that they consider tolerable is akin to dismissal and marginalization—far from the “progressive realization of the right to adequate housing” guaranteed by the post-apartheid Constitution in these residents’ book. Zachary Levenson is a PhD candidate in sociology at UC Berkeley. His research focuses on urban sociology and the political economy of housing, particularly in South Africa and Southeast Asia. Articulating Trumpism, or, Thanks, Obama!